...this weekend. I love Cindy Woods' drawings of Richmond store windows. She inspired me to sketch a window display in Goteborg, Sweden when I was there last December. 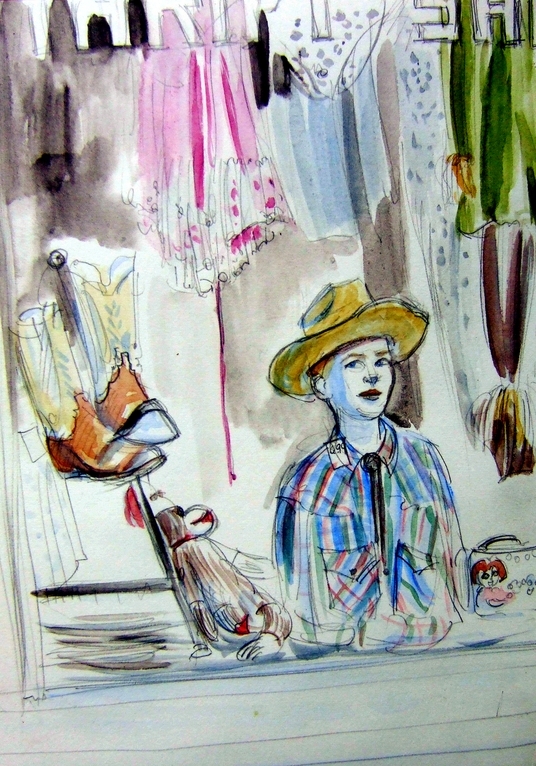 And her inspiration struck again today as I sat face to face with a sly cowboy in a thrift shop window. And then there were the cafe moments. I snatched sketches of a few people in mid-bite or mid-word. The man on the right noticed early on that I was drawing him, so I had to stop. It was making him self-conscious. Hi Laura - I absolutely love these cafe series, such beautiful coulous. I like the way you draw people, it's so loving and warm. What fun these are, I love your fluid lines. Thank you, recent commenters, Tara, Cin, Sarah! Sarah, we won't be scary, I hope! Well, if we are, they'll get over it. I'll emai you in the next few days and we'll make a plan. 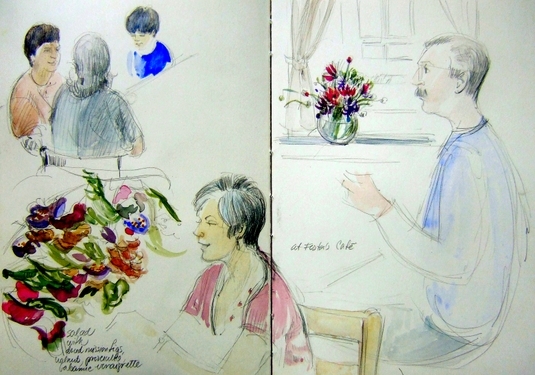 Lovely sketches as usual, am looking forward to a sketch fest lunch or something in Paris. Will we be too scary...an en masse sketching monster? I love how you so perfectly capture people mid-motion, doing what comes naturally. And that thrift shop window is fabulous! So many contrasts within one space.